Instantly engage students and captivate thier attention with hands-on interactive learning. Students and teachers can use a pen or their finger to interact with dynamic lesson activities and take control of the connected PC using the interactive whiteboard’s large, touch-enabled surface and digital ink system. The Smart Board M680 interactive board is the direct replacement for the old SB660, SB640 which are now no longer manufactured, the new m600 series offers many additional features all aimed at assisting a more collaborative interactive learning environment. DViT® technology provides support for two simultaneous touches, making it easy for two students to instantly collaborate. Both students can work together at the same time, using pens (included), their fingers or other objects to write and perform gestures. Two students can instantly start working together without having to switch to a multiuser mode or work in confined areas of the surface. Students can switch naturally from collaborating with each other to interacting with lesson content. A natural touch experience makes it easy for students and teachers to interact with content, writing, erasing and performing mouse functions using a finger or pen. They can also use intuitive gestures such as flick, rotate and zoom, which makes content easier to conceptualise and comprehend. Improve the legibility of your handwriting as you write over applications, websites and videos. The ink becomes an object that you can move and manipulate. The pen tray provides quick access to ink colour selections, the on-screen keyboard, and right-click and help functions. 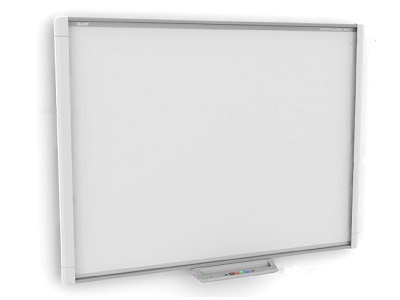 This makes it easy for teachers to facilitate learning whilst standing at the interactive whiteboard. Capture your work in SMART Notebook software as a screen shot that can be edited or saved directly into several software applications. You can also capture student work and use it later for reporting or assessment. The low-gloss surface is optimised for projection, ensuring that content can be clearly seen from anywhere in the room. The surface is also easy to clean and is compatible with dry-wipe markers. This software sets the standard for creating, delivering and managing interactive lessons - all within a single application. Teachers can easily create engaging interactive lessons, and then save notes or content from those lessons to share with students. SMART Notebook software also provides a common platform for linking a variety of classroom technologies and student mobile devices.